CES may be the world’s largest showcase for technology’s giants, but it’s also one of the primary hubs for the scene’s innovative upstarts. One of its convention areas, known as “Eureka Park,” often hosts more than 1,200 startups from more than 40 countries. And although flashy booths from the likes of Google, Intel, Huawei and more typically generate buzz, it’s the startups that tend to have riveting stories — and even some of the most talked-about products. Here are five of the most inspiring startups we found at the show. Leal Tien has always been a fan of science-fiction novels. That’s why The Hitchhiker’s Guide to the Galaxy’s “Babel fish” — a creature that can reside in your ear and translate any language spoken to you in real time — inspired him to co-found his translation tech company. 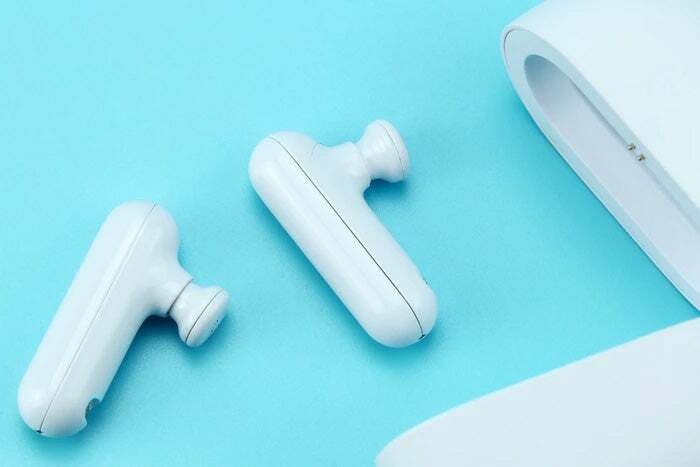 Launched in November 2018, Timekettle‘s headline product is the WT2 Plus, a set of AI-powered translation earpieces that’s already brought in about $3 million in sales despite little to no advertising. Another of Tien’s inspirations? His parents, who speak only one language. He sent them on vacation to the Alps in 2016 and downloaded many translation apps for them, but Tien’s parents didn’t use them — even when his mother got altitude sickness. “It was too awkward,” he remembers hearing. Finally, Tien understood that it wasn’t just about translation — it was about communication, comfortable interaction and building closer relationships. “We believe translation is not enough,” he said. Currently, most translator options on the market require more work on the consumer’s part than the WT2 Plus does. Competitive translation products usually dictate that one person speaks at a time, that someone needs to download an app or that one person speaks into a smartphone while the other uses an earpiece. But using Tien’s solution, people can communicate via simply splitting the earpieces and sharing one with another; then, they can both start communicating immediately. The earpieces also make use of dual-noise reduction tech by way of neural networks, and they can translate more than 36 languages. Build something you yourself would buy, and others will likely do the same. 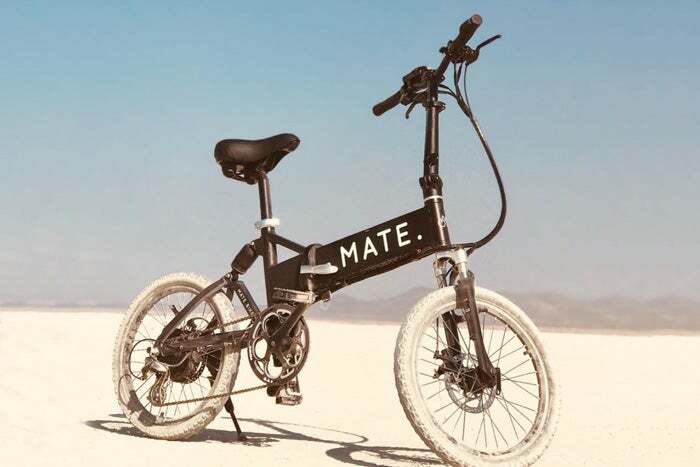 That’s one of the reasons Christian Adel Michael and Julie Kronstrom Carton founded MATE in 2016 after spending about two years searching for a cool, affordable electric bicycle. The brother-and-sister team hail from Copenhagen, a city that apparently has more bikes than people. When the two couldn’t find a hip, clean-cut e-bike, they knew there was a “hole in the market,” Michael said. They decided to fill it, starting work on the project in 2016 and simultaneously launching their first crowdfunding campaign on Indiegogo. Since that first campaign, MATE has sold 8,000 bikes to customers in more than 50 countries. That’s key because if the siblings had gone the traditional route of distribution chains, they would’ve needed to adhere to store inventory guidelines, potentially manufacturing many more products that people would order. By selling directly to their customers, they manufactured the exact amount of bikes that were ordered (and likely saved 10 to 40 percent on manufacturing costs, said Indiegogo CEO, David Mandelbrot). The company also reached a prominent crowdfunding platform milestone: After raising $20 million over two campaigns, MATE has raised more money than any other company in Indiegogo history. Common crowdfunding advice is to work on “creating hype” for your product for up to six months or a year, but Michael and Carton didn’t do that, instead opting to put some money towards targeted ads on Facebook and elsewhere online. The e-bikes are available now, and until Jan. 31, 2018, discounted pricing starts at $699 plus shipping costs. After that date, prices in the U.S. will likely rise to between $1,400 and $2,000, Carton said. It’s difficult to disrupt the hearing aid industry — it’s institutional, and it’s regulated by the FDA. But among individuals ages 20 to 69 with hearing loss who could benefit from hearing aids, only about 16 percent has ever used them. That suggests the time is ripe for something new. And Eargo — cool, invisible hearing aids sold directly to consumers instead of through a clinician — offers just that. 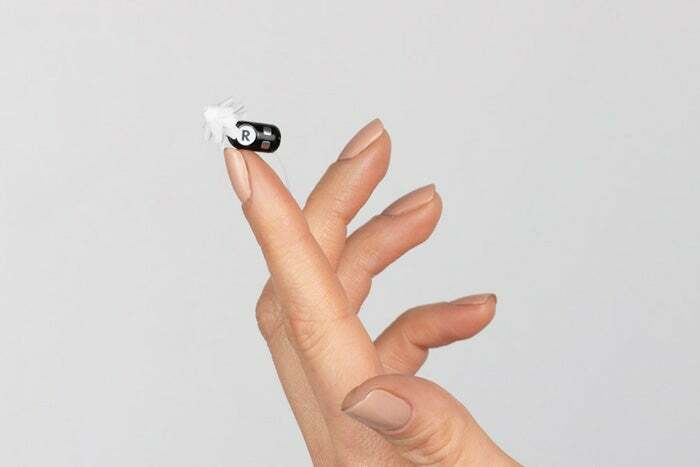 Prices range from about $1,950 to $2,750, which the company says is much lower than the $8,000 to $10,000 industry standard for “invisible” hearing aids, and they come with a sleek portable charging case. Founders Florent Michel, a medical doctor, Raphael Michel, and Daniel Shen wanted to decrease hearing aid cost and stigma, and they did it by way of the former’s invention of Flexi Fibers — medical-grade silicone and a key part of Eargo hearing aids. In Dr. Florent Michel’s work as an ENT surgeon, he encountered many patients with hearing loss and saw the stigma associated with hearing aids firsthand. His son Raphael met Shen at Stanford — the former was in the design program, while the latter was studying medicine — and in 2010, they launched the company out of Raphael’s Palo Alto garage. Hearing aid regulations were stringent, but Eargo found a grey area: The FDA doesn’t regulate the sale of hearing aids. That’s regulated state by state, and if you’re certified to sell (or “dispense”) hearing aids in one state, you’d have to pass an examination to sell them in another. Eargo put its product up for sale online, directly to consumers. Industry veteran Christian Gormsen thought it was crazy (What kind of consumer is going to spend thousands of dollars on hearing aids online, especially when many are in their 60s and older?) Now, Gormsen is Eargo’s CEO. Musini resolved to design one: a “someone” inside the home to serve as a sort of health aide, especially when it comes to taking medications as scheduled. Home caregivers are cost-prohibitive for many families, and he wanted to make aging in place — in the comfort of one’s own home — more accessible. That’s why he created Pillo, a healthcare assistant for the home, after co-founding his company Pillo Health. The device is available now and costs $499, plus a $39 monthly subscription. Scheduled reminders cause Pillo to “wake up,” scan the room for an individual and alert them it’s time to take a certain medication. The user can then opt for Pillo to dispense it. 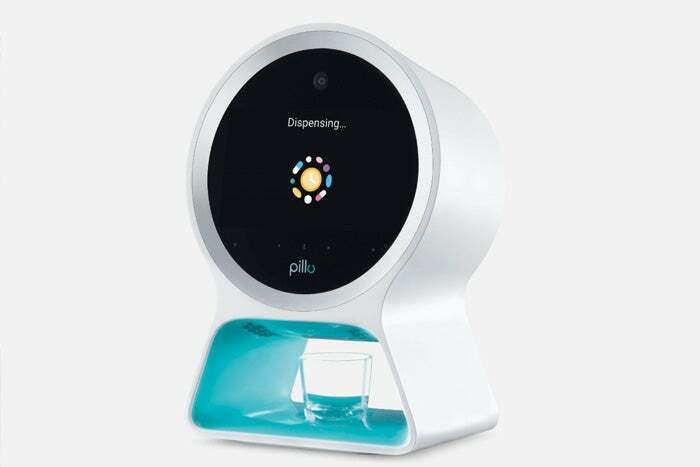 If they don’t take their medication for a set period of time, Pillo will alert the user’s care team (whether medical professionals or family) so they can start a conversation. Consumer robotics company Intelino is the very definition of a startup: founder Dr. Armen Kroyan officially launched it the first day of CES 2019. Its first product? A $99 “smart train set” billed as the first of its kind, complete with engine, wagons, track pieces, decals, charging cable and — perhaps most unique — “action snaps,” or small, colored plastic tiles that can snap onto any piece of track. The tiles’ colors are correlated with different smart features — green denotes speed, for example, so placing three green action snaps in a row would command the train to move fast, two would yield a medium speed and one would mean slow. One red action snap tells the train to stop for two seconds, while three in a row would make it stop for 10. Blue is associated with direction, while yellow is for dropping off a wagon. And there’s an optional Bluetooth-enabled companion app that can act as a train dashboard, manual override mode, way to create custom action commands for the snaps and more. Kroyan dreamed up the new take on “connected play” from firsthand experience as a parent to two young boys. His older son, now age 7, has been playing with train sets since he was 2, but the way he played with them shifted over the years: At first, he needed a lot of help building the tracks, but as he grew, he built more and more elaborate track designs. Kroyan wanted to create a way for kids, including his own, to use technology actively instead of passively consuming content by way of screens. Inspired by his son, he decided to take the intuitiveness of the classic toy train experience and augment it with an interactive, tactile layer of technology. 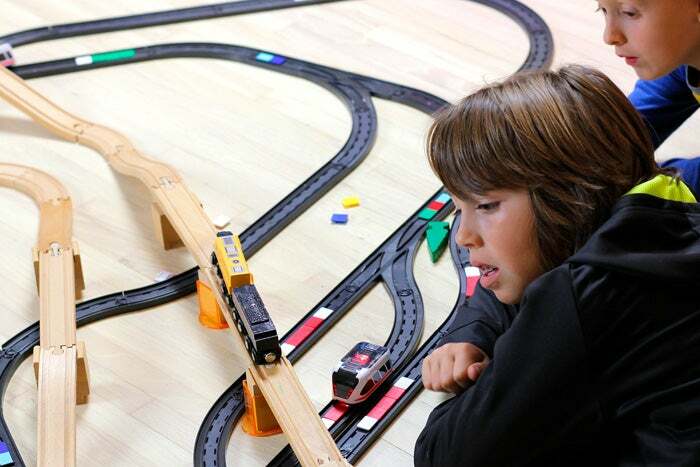 Trains were a perfect platform for the sort of sequential thinking used in STEM, he thought — before a child builds a track, they often need to preconceive what it’ll look like on the whole. The train set, available to consumers in March 2019, is retro-compatible with wooden tracks so that it can serve as an addition to any child’s set, and Kroyan hopes it will grow up alongside kids that may first use it as an ordinary train set, then move on to use action snaps to build elaborate sets. As a rule, those steps don’t require any sort of screen interaction, Kroyan said, but if parents want to allow usage of the accompanying app, later on, it can add a new layer to what a child can do with their train set.